I have in previous reviews discussed His Symphony Orchestra. In short, it was a collection of the finest musicians in New York City including such notables at Robert Bloom on the oboe. Stokowski used tape editing and other knob twisting to create a sound that was much bigger than the actual size he was working with. The results were fabulous. 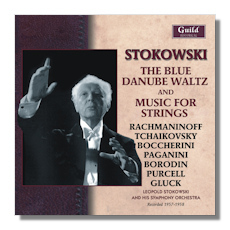 This Guild release is the first to include the Strauss recording on CD. It was originally on the LP "Landmarks of a Distinguished Career" but when the same named CD was issued in 1996 (EMI CDM65614) it omitted this item and tossed in several from other releases. This release includes only the Strauss from the original LP and takes the rest of the music from the LP issued as "Music for Strings". Whatever. Both of those CDs suffered from horrendous remastering and sounded almost monaural. When I first started studying classical music in 1976 I would frequent a record shop in Columbus, Ohio that was across the street from Ohio State. The manager was Al Franz and we got to know one another as he led me through recommendations for recordings in my budding library. Years later Al and I would get together and listen to recordings on LP and CD. Al had a stereo system that was amazing. He would put on an LP and say, "There's more music in those grooves than most people know." His equipment verified that notion and we would spend hours listening to music not heard on normal equipment. This release bears that out. I was simply stunned by the sound. I listened to the disc over several evenings and was amazed at the detail and depth of the recording. The rich, firm bass line for which was essential to 'The Stokowski Sound' is now present where it was lacking in previous CD releases. The fact that they used LPs from Edward Johnson's collection (among others) proves that Al was right. I sampled the LP still in my collection and there is more music in those grooves than I can hear on my LP. This disc is strongly recommended for not just lovers of Stokowski's magical music making bur for any lover of classical music.